A government-backed project set up to monitor anti-Muslim hate has recorded 632 incidents in its first year. The UK project is based on the Community Security Trust's model, which records anti-Semitic incidents. 'Tell Mama' is run by interfaith organisation Faith Matters, which says victims who have come forward range from a five-year-old to an 89-year-old. They say women are targeted more than men and the majority of incidents are online abuse. Mama stands for Measuring Anti-Muslim Attacks and Fiyaz Mughal, director of Faith Matters, said he wants to see a notable change in what is considered acceptable behaviour in the UK. "By highlighting these incidents we want people to realise that Islamophobia is equally as disgusting and poisonous as anti-Semitism and I think that people do not take it at that level right now - at least some people don't," said Mr Mughal. "We need to reduce the volume of online hate towards Muslim communities, but we also need to create some framework for the police and other institutions to get them to up recording and prosecutions in this area," he added. This week Tell Mama is launching a free smartphone app to support access to the service. Three-quarters of the incidents recorded by Tell Mama occurred online, with Twitter particularly highlighted as a source of abuse. In cases of verbal or street-based abuse those behind the project say it is Islamic clothing, like hijabs, that singles people out. Other incidents include direct attempts to offend those of Muslim faith. In January a pig's head was left in the garden of an Afghan family in London. 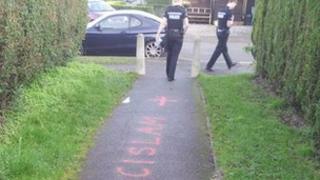 There have been a number of incidents involving pork-based items being left at mosques and in December a cross wrapped in ham was left outside the home of a Muslim family in Bingham, Nottinghamshire. Murad Alam, 39, moved his wife and two young sons out of the area following that incident. He says he was happy to deal with the police himself but he said Tell Mama was vital in bringing attention to what had happened. "I looked online and found the service so called and told them what had happened. They contacted the media about it which was great for me; I needed people to know what had happened," said Mr Alam. "To be honest I don't think Islamophobia is taken very seriously - it feels like if what had happened to me happened to a Jewish family there would have been outrage," he added. "There's a sense that because of our history as Muslims, terrorist atrocities and such, people feel like we deserve the abuse," said Mr Alam. The 2011 census revealed there were 2.7 million Muslims in England and Wales (4.8% of the population) - compared to 1.5 million in the 2001 census (3%). The Home Office has also recently started publishing statistics for all hate-crime in England and Wales. In 2011-12 43,748 hate crimes were recorded by the police, of which 35,816 (82%) were race hate crimes and 1,621 (4%) were religion hate crimes. The comparison with anti-Semitism is frequently mentioned when discussing this work - the Jewish community is much smaller in the UK, but has for years recorded anti-Semitic attacks. The Tell Mama project wants to carry the same weight as the Community Safety Trust (CST), which has for almost 30 years been recording incidents of anti-Semitism in the UK. The CST published its annual statistics in February and recorded 640 anti-Semitic incidents across the country in 2012, compared to 608 incidents in 2011. Of these there were 69 'violent anti-Semitic assaults' in 2012, including two classified as extreme violence; 53 incidents of damage and desecration of Jewish property; 467 incidents of abusive behaviour, including verbal abuse, anti-Semitic graffiti and one-off cases of hate mail; 39 direct anti-Semitic threats; and 12 cases of mass-mailed anti-Semitic leaflets or emails. Mark Gardiner of the CST said he was pleased their work could inform Tell Mama. "CST is glad that our work countering anti-Semitism has helped Tell Mama provide the Muslim community with a proper mechanism for reporting and understanding anti-Muslim hate crimes," said Mr Gardiner. He said: "It has taken CST nearly 30 years of focus and professionalism to get to where we are today, so what Tell Mama has achieved in just one year is very impressive. "We wish Tell Mama every success for the future; and if our joint co-operation helps break down barriers between British Muslims and Jews, then all the better." Mr Mughal is encouraging more people to report: "We need to send a clear, straight message that this is not acceptable because to be honest those working on this project feel that in some instances Islamophobia has actually passed that dinner-party test that Baroness Warsi talked about and we think it's a bad place that we're in right now." You can hear more on this story on the BBC Asian Network on Monday, 11 March at 13:00 GMT and 17:00 GMT or listen back on BBC iPlayer.